Summer is officially over, but this heat is still sticking to us like a pair of wet jeans. Well, ya still gotta eat, so take it outdoors and stand in the shade while you warm up your grill because here is a simple and light grilled salmon recipe with red chimichurri. The sauce in the recipe below adds layers of flavor to your fish, with vibrant fresh green herbs of cilantro and parsley, plus a little bite of raw garlic and the tang of fresh squeezed lemon. 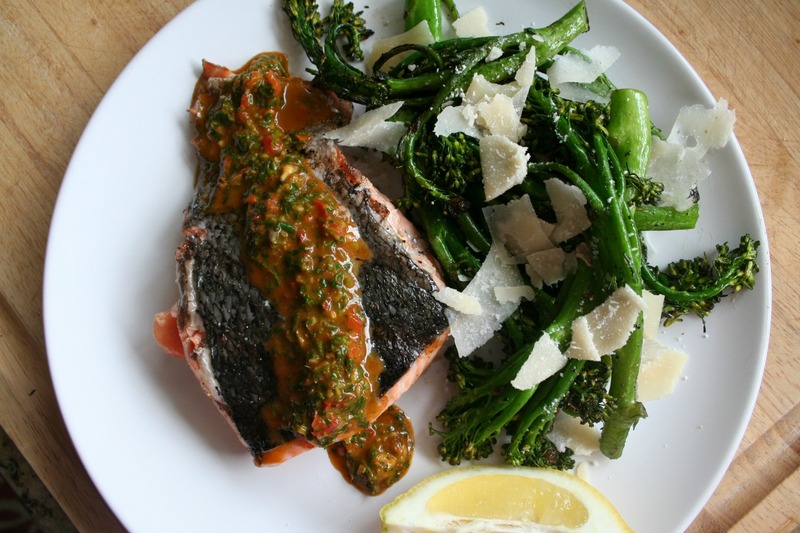 We served it with charred broccolini, shaved Parmesan and a glass of chilled wine. Any grilled veggies will work, but we highly recommend drinking wine. In a food processor, combine the pepper, salt, chili flakes, paprika, oregano, lemon juice, cilantro, parsley, bell pepper, green onions, garlic, and vinegar. 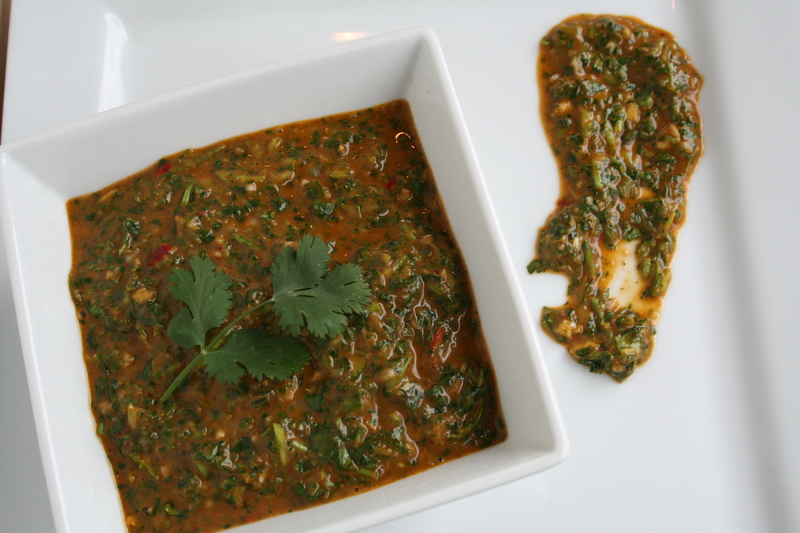 Blend on low while simultaneously drizzling in the oil, until it forms a wet sauce-like paste. Preheat your grill. Prepare your salmon for grilling by rubbing it lightly with olive oil and lightly sprinkling with salt and pepper. 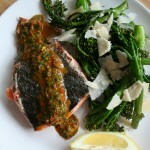 To serve, drizzle the red chimchurri on the salmon and enjoy. A 1-inch thick fillet will take about 6-10 minutes to cook. 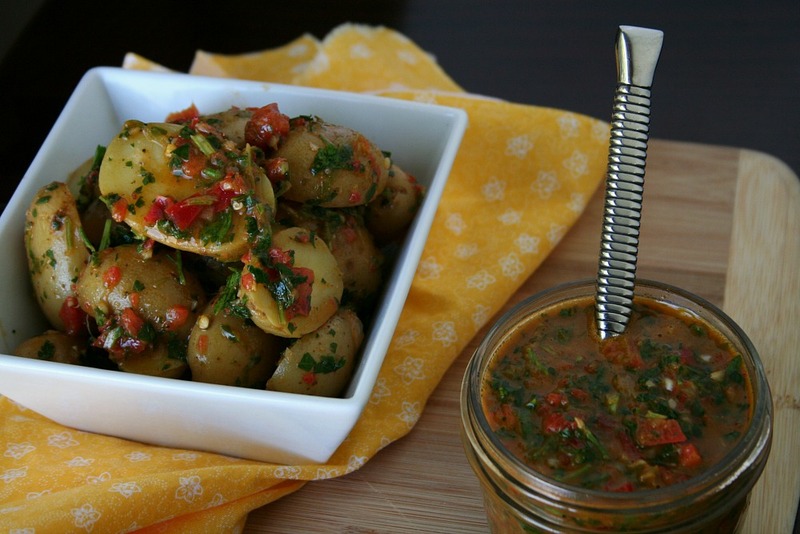 Click on the photo to see how else you can use the red chimichurri sauce!